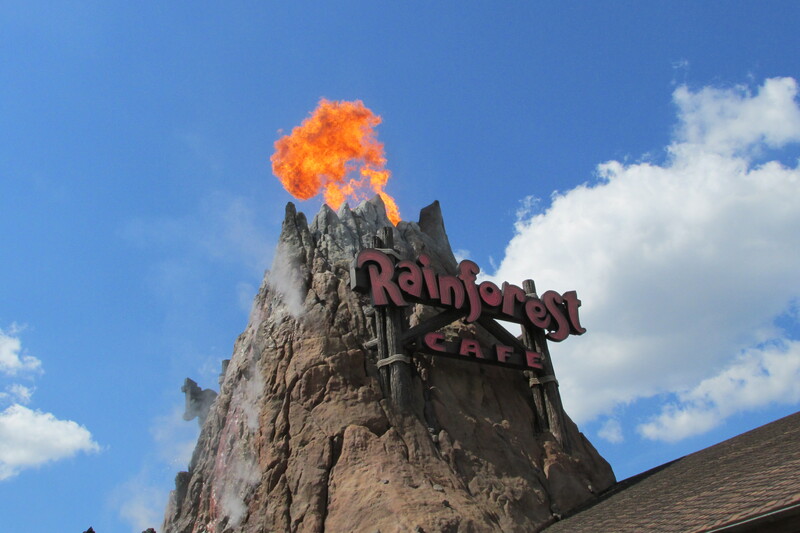 One of the restaurants that we visit year after year when we go to Disney World is the Rainforest Cafe at Downtown Disney. It’s our tradition to go to Downtown Disney the day we arrive and so far I haven’t been able to successfully convince the boys to want to eat at someplace different. Not that the Rainforest Cafe is bad, but it would be nice to change it up, right? We had reservations for lunch, but our table wasn’t quite ready when we got there, so we sat outside and waited. It was so sunny and warm that day & we were all enjoying being outside. As we waited, the big volcano outside started to erupt. I am not sure how often it goes off, but in the last five years we’ve gone there, I’ve never seen it. Once we got seated, we all devoured our food in record time because we knew what was coming – DESSERT. 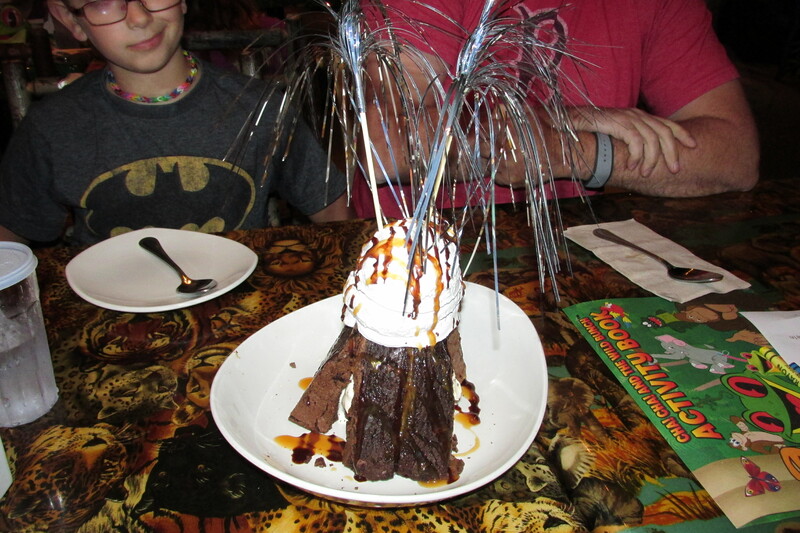 They have this amazing dessert called a volcano at the Rainforest Cafe. It’s basically just a HUGE brownie sundae, but it’s so good. The four of us went at it and it was so big that we couldn’t finish it. But we had fun trying. Have you ever been to a Rainforest Cafe? I’ve been to five or six of them, but there is nothing like eating at one of the two in Disney World. How cool that the volcano erupts like that. I’ve been to a couple of rainforest cafés, but not the one in disney. That volcano cake looks like it could put us all on a sugar high. Yum… It does look great though. It’s nice to see these are still around! There used to be one in the big mall by us but it closed down years ago. It was a fun place to eat! And that dessert looks amazing! There is a Rainforest Cafe in Niagara Falls, ON … it’s not that cool. I’ve been but I’ve never seen the volcano. COOL! I love that place we have only gone to the one here a few towns over but it’s a huge treat. It is really cool eating there. We’ve been to one in KC. We never had their dessert though. 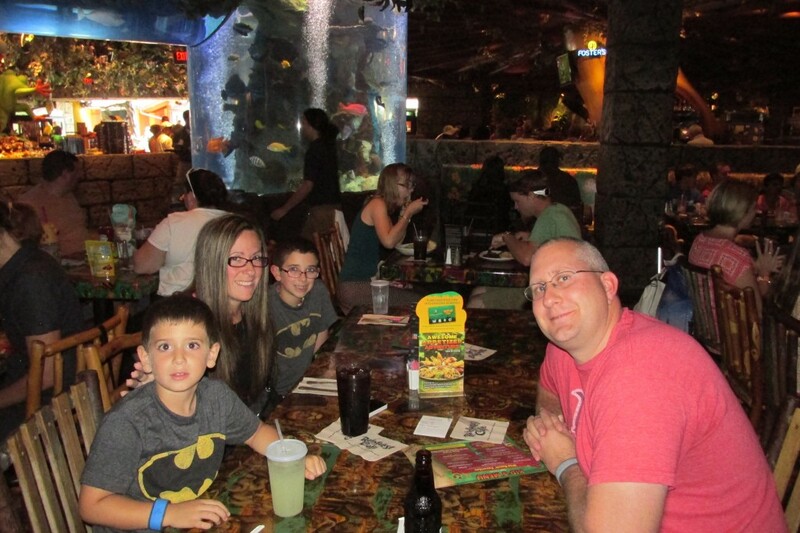 I have heard such great things about Rainforest Cafe but we still have not eaten there – it’s def on the list. Maybe when we’re in Orlando! Ah yes, another place we get suckered into spending a ton of money at lol. We didn’t go to Rainforest at Disney, but we have been to the one in Chicago a few times. The atmosphere is really cool, and I admit, I even have fun browsing the gift shop there. I really need to get me one of those lava brownies. OMG they always look so good! I have actually been to one. We just bought gifts in the gift shop but did not eat there. I would love to try the volcano though! I never knew the volcano erupted either. We are heading to downtown disney soon, can you tell me if they play music or have lout sounds. The last restaurant we tried there was too loud for my youngest so we had to leave without eating. It is pretty loud, actually. The animals making noises individually aren’t so bad, but they do a thunder storm every half hour where the lights go out, they pipe in the sound of thunder and all the animals go crazy at once – that is pretty loud. My son is 3 years old and would absolutely love everything from the volcano view outside to the aquariums inside and great food! 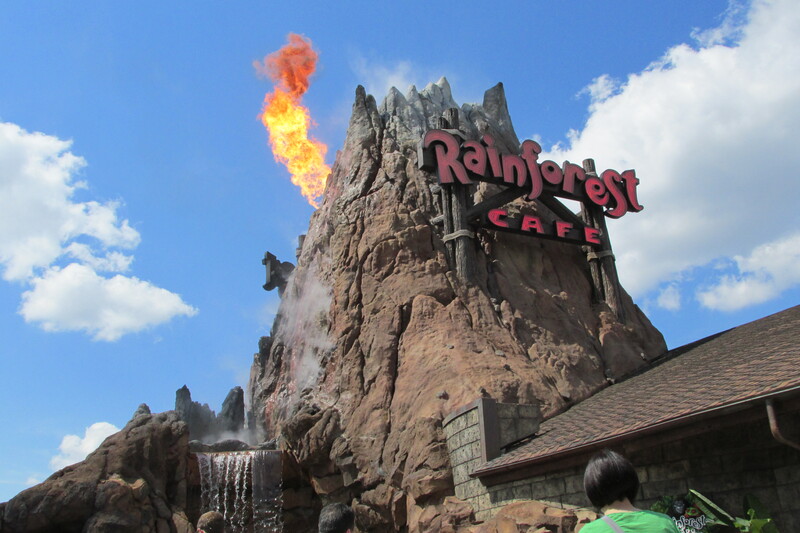 I have never eaten at the Rainforest Cafe at Downtown Disney, only at Animal Kingdom. We love it. It is loud but once the kids get use to the noise or know what to expect it is so fun. Rainforest cafe looks absolutely amazing! I would definitely love to dine there if we ever make it to downtown disney! After seeing this brownie sundae volcano I think I need to visit this restaurant on our next Disney trip. I have never been to Rainforest Cafe, but it’s definitely on my list of restaurants to check someday! I’ve never been to one, but this looks cool! I have never been to a Rainforest Cafe but it looks like so much fun! I think I could eat the whole dessert myself hahaha. I love Rainforest Cafe! It’s one of my favorite places! Yes, I have been to that one and the last time I went they were on a 4.5 hour wait! I love, love, love Rainforest Cafe! I havent been to one like forever. They are so awesome! I love the Rainforest Cafe. I went to the one in Vegas, but we have one outside of Seattle too! I have heard lots of great things about the Rainforest Cafe. If we ever get a chance to go to Disney, I’m sure we will definitely go there! oh my at that brownie volcano!!! i love the rain forest cafe — been to several all over the place. it’s one of our potential stops while we are in disney in february! I love this place! My family and I like to frequent theme restaurants and this one looks amazing. The volcano is a nice tough and I love how they decorate the dessert. How awesome that you finally got to see the volcano erupt! I want that volcano, pronto!! We ate there when we there in March. It was great!